Update: Dember 27th, 2013: The reward money has now been raised to $20,000. Some of the most recent articles relating to Heather Elvis' case are, "Volunteers, police continue search for Heather Elvis in Socastee" and "Cue Center for Missing Persons continues to search for Heather Elvis". The family of Heather Elvis has raised funds for the reward for information about the missing 20 year old. Heather's father took to Facebook last night to express his and the families anger and frustration over the lack of new or updated coverage by the media. Christmas came today like a thief in board daylight, robbing me and my family of joy and happiness, no Christmas miracle no smiling faces, only a pretend half smile from a sister missing her other half. Parents trying to hold back tears and a brother sitting hundreds of miles away trying to cope with the situation but because of his tender heart there is no way to wrap his head around the situation. It has been over 35 hours since ANYONE from Law Enforcement has been in contact in any official capacity thou dozens call and text and visit that are friends on other Departments who feel helpless since they are not associated with the case but still try and look into as much as possible without messing up any legal part of the case. I am beginning to become not only angry but very much disappointed in the system. News media looks for the next big story and gives you the cold shoulder with a sympathetic smile. could easily be anyone's at a moments notice. None of us are immune. Please contact the media, contact the Law Enforcement Agencies and voice your disgust in the way this is done, not only this case but any other one that does not get serviced as it should. Thank you for your support, we will continue to post flyers, posters, banners, web updates, phone calls and pressure till such time as this is resolved. NO CHILD, NO HUMAN should EVER be left like this and not have an advocate for their safety and wellbeing! EVER! Heather is 5-1 and weighs 118 pounds. She has brown hair and brown eyes. People with information can call 843-457-5747, or county police at 843-915-5350. The newest reward poster can be found here and make sure to head over to the Find Heather Elvis Favebook page for the most up to date info. 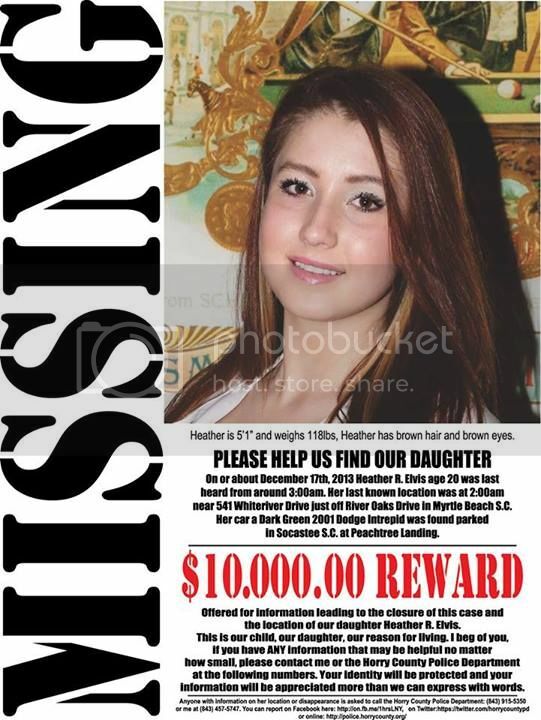 "A $1,000 reward has been offered to help fund a Myrtle Beach area woman last known to be in the Carolina Forest area. Horry County police said Friday that a car belonging to Heather Elvis, 20, was located in the 6600 block of Peachtree Road near at the boat landing. Horry County police with help from several agencies searched the Intracoastal Waterway by boat and with a SLED helicopter, but Elvis was not found." Anyone with information regarding Elvis’ whereabouts can call Horry County police at 915-5350.